The summer is over - that means Jimmy Buffett must be in town this week, baseball is winding down and football/hockey are about to rev up. 1. We will be at Saturday's Buffett show...tailgating and getting bombed, if you are also there stop by and the 1st funnel is on me!! 2. The Sox play Tamba Bay next week and then again the week after, could be 2 huge series. 3. BC won 21-0 this past Saturday and they have their home opener on Saturday. 4. The Pats kick off the season Sunday versus Kansas City, lets just hope Brady is back on the field. 5. The Bruins training camp starts in a little over 2 weeks, September 18th. I mean what else could we want? "He watches a lot of hockey, so he knows about Milan. We said we're going to set up a Lucic-Phaneuf fight. When we go to Calgary, Jarome said he's going to do his part to get Dion all fired up. We'll get Looch the same way. No problem." The Globe indicated that Ference was joking, which is a damn shame. We agree with Scotty Hockey: "The NHL needs more stuff like this to not only happen, but to come to light. It builds rivalries and draws fans." There's a difference between anticipating a bloodbath between two teams coming off a nasty fight-filled game and building anticipation around a potential battle between two charismatic heavyweights. We're always debating what, exactly, made "the good 'ole days" of NHL hockey more appealing (in some ways) than the current product. When's the last time you tuned into a game because two heavyweights might drop the gloves? Because there were thousands of fans 20 years ago that would make time to see Bob Probert take on his latest contender; on the off chance he'd lose, the anticipation would be even greater for the rematch (like his infamous battles with Troy Crowder, then of the New Jersey Devils). Same goes for Tie Domi, or before him guys like Nick Fotiu or Dave Schultz. It didn't overshadow the game; it just added to the excitement. 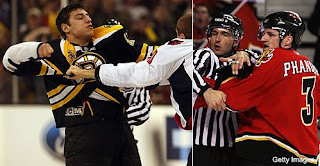 Fight critics label the intentional staging of high-profile fights as "circus acts" or attempt to paint them as harbingers of hockey's deteriorating honor code. Which is, as usual, more rhetoric about what the pacifists want hockey to be rather than what it is or what the majority of fans appreciate about it. Here's the bottom line: We didn't realize the Bruins played the Flames on Oct. 30 before Ference mentioned the potential for a Milan Lucic-Dion Phaneuf throwdown. Now, it's on our calendar.